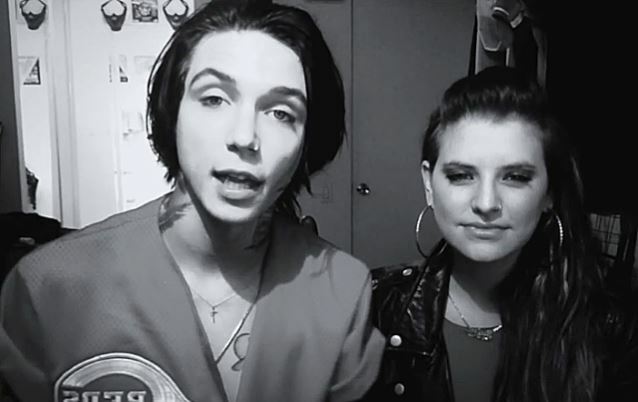 Vocalist Andy Biersack of Los Angeles theatrical rockers BLACK VEIL BRIDES and his girlfriend, Los Angeles-based singer/songwriter Juliet Simms, who is best known as a contestant on the 2012 season of the NBC reality TV talent competition "The Voice", have joined together with the Alive Music Project and the It Gets Better campaign to support LGBT (lesbian, gay, bisexual and transgender) youth, challenge homophobia, and expose new communities to the message of equality through music. In doing so, they have created a Prizeo campaign offering rewards such as signed photos, t-shirts, signed guitars, and even a personalized tattoo design. One lucky entrant will win a trip to 2015 Vans Warped Tour on August 7 in Portland, Oregon from anywhere in the world and will receive VIP tickets and travel on Juliet and Andy's tour bus to Seattle, Washington on August 8. Every year over 85 percent of LGBT students in American schools are physically or verbally abused. The Alive Music Project and the It Gets Better tour aim to combat bullying and bring music back into schools in Los Angeles and across the country. Alive Music Project is dedicated to proving that music and song are community building. Through music, students are engaged in understanding and discussing human rights, civil rights, and the LGBT struggle for equality. We are committed to changing hearts and minds through music, and inspiring students to use their art in order to make their voices heard! It Gets Better tour takes the profound message that darkness can give way to a brighter future one step further, as a small, dedicated ensemble travels to communities nationwide to produce a week of educational workshops culminating in a moving musical theater performance. The week highlights anti-bullying, tolerance and acceptance through community roundtable discussions, high school visits, videos and creative exercises. Both the Alive Music Project and the It Gets Better tour are programs of The Gay Men's Chorus Los Angeles (GMCLA) — changing hearts and minds, one song at a time.